Many people have watched birds flying above the majestic Rocky Mountains and wondered what it would be like to have the opportunity to see the Rockies from a bird’s-eye view. With a paraglider or hang glider, you can do just that. Both hang gliding and paragliding in western Canada have steadily grown in popularity since then. Max Fanderl has been paragliding and hang gliding since 1986 and became one of the first certified paragliding instructors in Germany in 1987. He started his career as a test pilot for wing manufacturers before moving from Germany to Canada in 1991. Fanderl now owns a paragliding school in Invermere, B.C., and has represented Canada four times in the Red Bull X-Alps, a roughly 1,000 km flying adventure race from Salzburg to Monaco. Athletes participate by invitation, and complete the course with a paraglider and a pair of hiking boots. Fanderl says paragliding & handgliding is as safe as any other sport, but participants need to be prepared to put in the time to learn it. For those who want to experience the sport, tandem flights are a good option and safe for anyone – kids included. Fanderl and his wife Penny Powers, also a paragliding pilot, started taking their children on tandem flights at the age of three, and still regularly fly tandem with them. Frank Kernick, a close friend of Fanderl’s, has been a paragliding pilot since 1991. He became hooked after watching paragliders land right in Canmore. In his 22 years as a pilot, Kernick has flown in countries around the world but still says that the Canadian Rockies offer some of the best flying conditions anywhere. 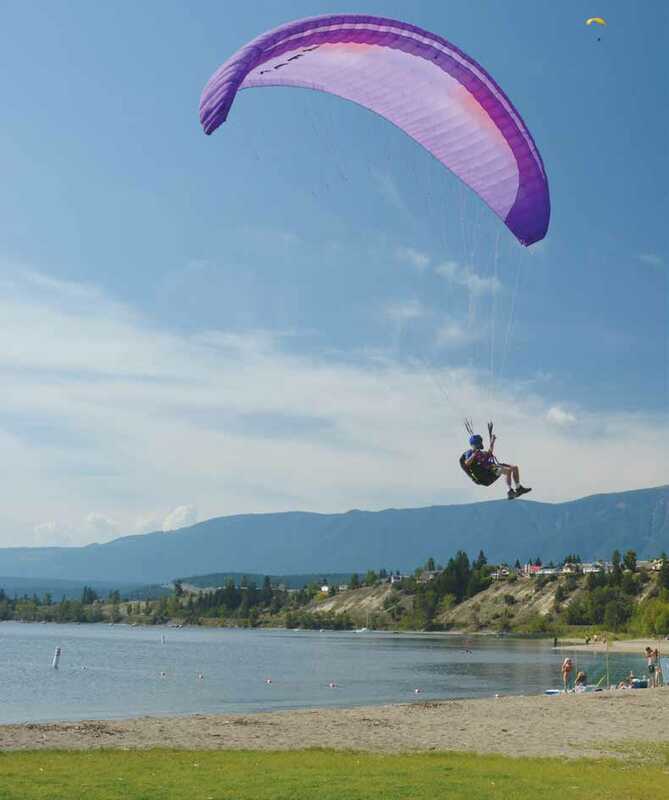 For the past 13 years, Kernick has organized the competitive Lakeside Event in Invermere, B.C., showcasing both paragliding and hang gliding. Entering its 38th year in 2014, the Lakeside Event has glider pilots launching from Mt. Swansea as they try to reach specific targets on the beach and in the water of Lake Windermere. Although many pilots strive to impress the large audience with acrobatics, Kernick says the true sport is about flying long distances. In the future, Kernick hopes to see hang gliding and paragliding become more accessible in the national parks. Currently, pilots can fly over parks but are not allowed to land in them. Given the minimal impact that hang gliding and paragliding have on the environment, Kernick hopes this will change. For anyone wanting to get involved in the sport, both Kernick and Fanderl say tandem flights are the best way to experience the relaxation of flying in the mountain parks. To find out more about hang gliding and paragliding activities, visit HPAC’s website at hpac.ca to find a list of local associations, clubs, and schools. Mount 7, one of Golden’s most spectacular mountains, was host to the Canadian Paragliding and Hang Gliding Nationals in 2011 and the launch site of the first world record set in 1986 by Randy Haney who flew a hang glider an impressive 325km from Mount 7 to Whitefish Montana. Eight world records for distance and speed have been set from the launch at Mount 7.